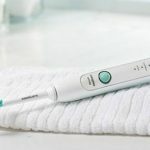 Like all other Philips Sonicare electric toothbrushes, the Sonicare HX6711 has the patented dynamic cleaning action that drives water between the teeth for superb cleaning of the teeth and gum line. 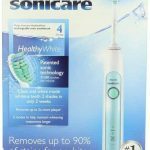 This removes up to 2x more plaque compared to a manual toothbrush and makes your teeth up to 2 shade whiter. Freshness and beauty combined. The slim ergonomic design and nice rubber grip ensure perfect handling and the brush head can be easily snapped on. 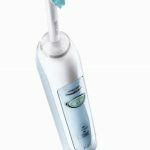 The Sonicare HX6711 has 2 cleaning modes: Clean mode, for your everyday brushing and Clean & White, which adds an extra 30 seconds to your brushing time and focusses on whitening your visible teeth. 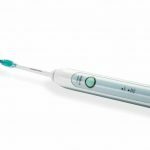 The HX6711 has a quad pacer interval timer that signals you to move to the next quadrant of the mouth every 30 seconds. It also has a timer that signals the 2 minute brushing time has ended, as recommended by dentists. The Easy-Start program gradually increases the brushing intensity over the first 14 brushes, so the brushing experience will be gentle. This is especially useful for those individuals that have sensitive teeth. 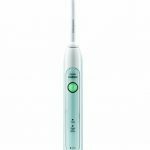 The Philips Sonicare HX6711 is a great electric toothbrush, with solid technology and different cleaning modes. The Easy-Start program can be a great feature for those with a bit more sensitive teeth. And importantly, it comes at a good price, because it has a bit fewer functions as the super high-end models. Nevertheless, this brush gives you pro results: clean and white teeth! 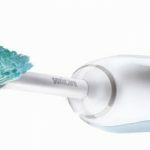 Want to use this toothbrush properly? Read our guide on How To Brush Your Teeth the right way.